I had the Lazer Tag rifle and it was awesome. We used it when we played Star Wars or whatever sci-fi war game we were playing. We rarely played actual Lazer Tag though. It was very cool, but the problems with a chest sensor were legion. People shooting with their chests covered by a tree, you can’t shoot them from behind. They had the hats and helmets but they were tiny and it sucked if you had a hat and they had a chest sensor. One time a friend and I were in a grappling match with the pistols, trying to shoot each other’s chest sensor. It’s cool to do that once. 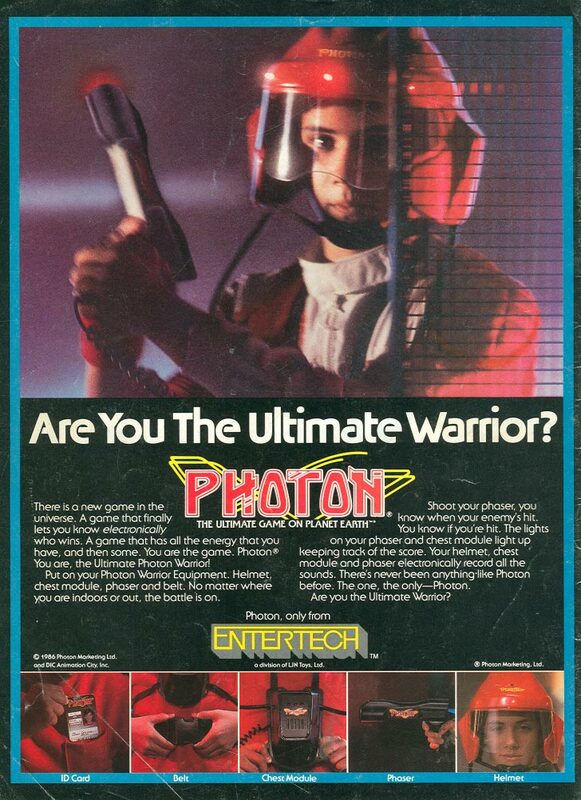 I loved the Photon commercials. I had Lazer Tag, too (in fact, I think it’s still hanging around somewhere). We kind of solved the sensor-being-covered issue by making a rule that you couldn’t shoot from a covered position (basically, you had to come out of hiding to shoot – no sniping); that didn’t stop me from setting my opponents gun to the narrow setting, though. We also would play a kind of hunter-type game; one person wore both sensors, leaving with a 10 second head start & the goal of getting to ‘home’ while two other people with the blasters would hunt the quarry down. Fun, if not a little warped. Your hunter game sounds a lot like a Logan’s Run re-enactment, heheh. The Most Dangerous Game: Lazer Tag Edition. I think I only played once, and it was Photon. I just remember being frustrated. Nerf has laser tag guns now, and I bet the tech is amazing compared to the original. Would love to try it.